The Community Buildings Network is a group which brings together people who manage community buildings across the city. TDC has been working with the Community Buildings Network for the past few years and helping support over 150 community groups to find funding and run their buildings smoothly. Thanks to a grant earlier this year from the Brighton & Hove City Council Communities Fund we have been working hard to help future-proof community buildings across the City by offering supportive health checks for Network members. These have involved reviewing strengths and weaknesses, identifying priorities and developing mini-action plans. We are holding an event in November to give Community Building Network members the chance to network and get support in managing their buildings. The event is free and we’ll even be putting on lunch, but advance registration is essential so we know how many of you to expect. Join us for all or part of this informative and informal day. 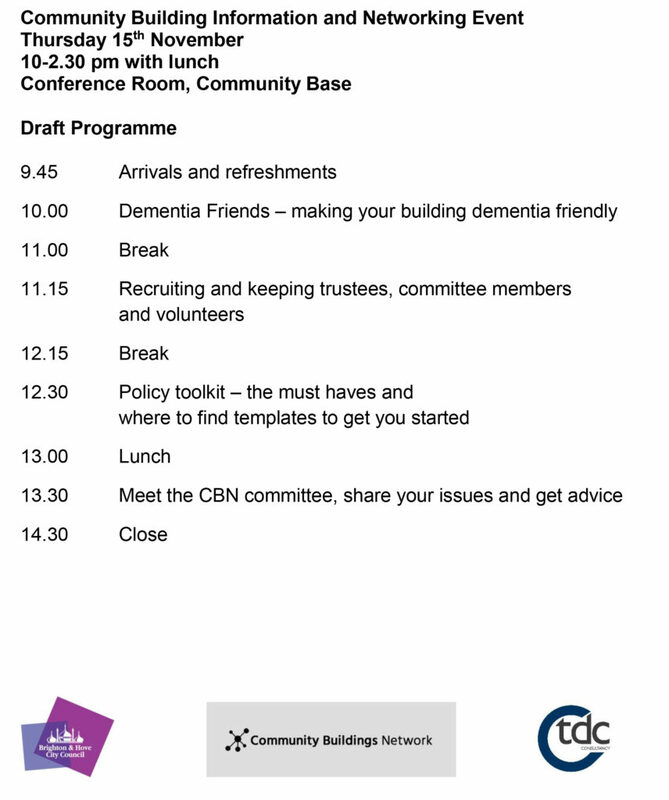 We know you are busy people so we’ve packed the day with lots of useful ideas to support you in managing your community building. We’re even providing lunch. For more information please contact [email protected] or call Cal Chester on 01273 262220.